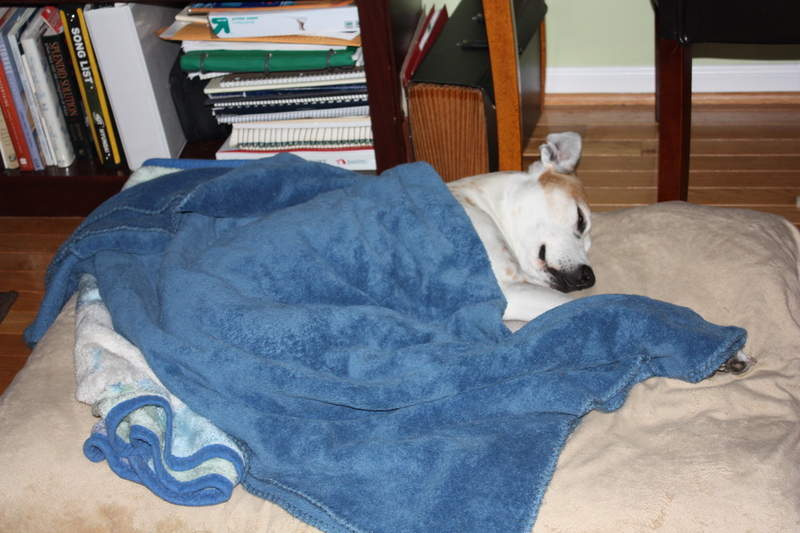 Tomorrow, Wednesday, will be 6 weeks of Alex being on limited walks and a lot of bed rest. Alex seems to be enjoying her bed rest. 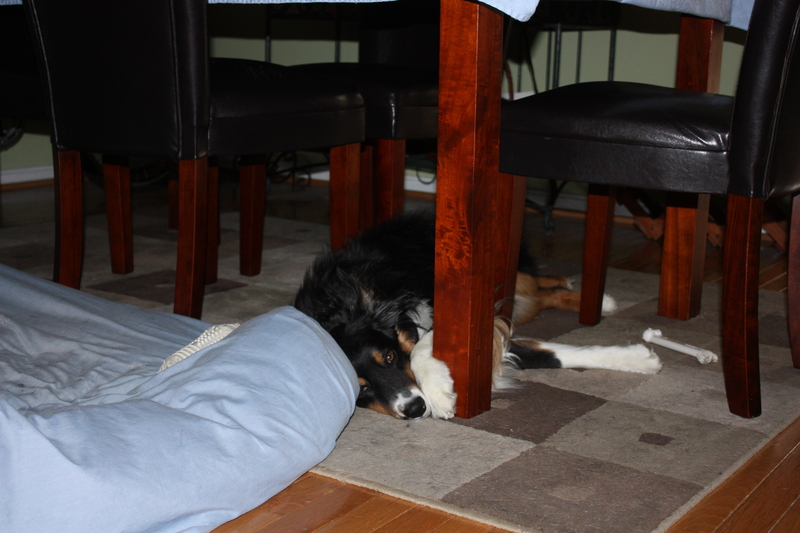 Walter, on the other hand, decided that the best place for him to hang out and fall asleep is under the table. I guess he does that because in the wild a den is where they go to sleep, raise a family and to avoid danger. What is your dog’s favorite place(s)? This entry was posted in Breeds, Dog Equipment, Dogs, Humor, Nutrition, Outings, Walking and tagged bed, Bedrest, Business, den, Dog, Recreation, thunderstorm. Bookmark the permalink. heidi’s favorite place is ‘heidi pawza’ which consists of her house and polar bear. lexis, my golden, goes where ever I am at. she got a new ortho bed, but everyone seems to use it more than her. my foster loves the couch with a pillow, she always has to have some type of pillow, even if she has to make it out of a blanket. 🙂 thanks for visiting and following my blog, touch of home pet care. yes, she is my shadow and I love it! 🙂 we were made for each other and so glad she found me. My boy also sleeps under the table, but what’s really cute is he loves to wiggle UNDER his grandmas couch. It’s less than a foot high and he sticks his face out to keep track of us. Luckily, he’s taking to his crate training for nap times quite nicely. He’s definitely a sleep in a den kind of guy ;-). I’ll have to take a picture and post it soon. He’s quite the personality :-). Unfortunately, not everybody knows that (especially guests!! ), and they complain when I start barking or scratching them to get them off my seat 🙂 Sometimes when that doesn’t work, I just sit on them. Lol. Great. Do what works for you because after all, they are in your home, right? Each boy has his own place. Old Kosmo sticks to his bed, young Kooper loves the lazy boy chair and middle Merlee will wait for the hubs, then lay on the couch. Little spoiled are my dogs! Lol. Yes, they are, but they also make life so much more interesting, don’t you think? Eko’s with Alex, he’ll take a comfy bed over the floor any day. 🙂 What a pair of spoiled children we have. Cooper loves right in my lap while watching t.v, and then on the bed all other times. Emma likes the lazy boy sofa. Do I spoil them or not? LOVE ALL YOUR POSTS.� MI CHINITA bond GIRL. I have two big beach towels in my office floor that she loves to sleep on. Bless him – I hope he feels much better soon!